Today on Calvary Comments, in honor of American Heart Month, we’d like to take a moment to talk about heart health. 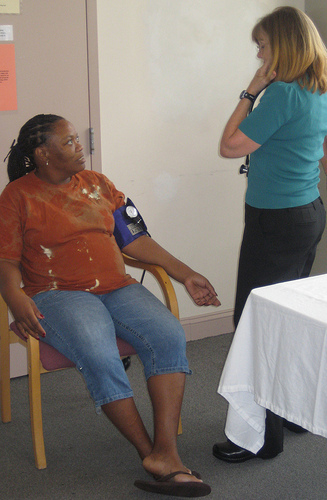 Women often come to Calvary Women’s Services with health concerns like high blood pressure and diabetes, and set a goal during their time at Calvary to stabilize their health. We support those goals in part through our meals program, which provides residents with nutrients that women who are homeless often lack – including whole grains, fruit, and vegetables. Life Skills classes on topics such as nutrition basics and stress management support the heart health of women at Calvary as well. Part of our new Life Skills program lineup also includes weekly aerobics classes to keep women active. Like so many health issues, awareness is often the first step towards staying healthy. To learn more about heart disease and what you can do to prevent it, read on. The term “heart disease” encompasses a number of disorders that affect the cardiovascular system (which includes the heart and blood vessels). Heart disease is the leading cause of death in the United States – and women are particularly susceptible. You may often hear people mention cholesterol as an indicator of hearty health. The term “cholesterol” can refer to both HDL (“good” cholesterol) and LDL (“bad” cholesterol). The amount of both types of cholesterol you have circulating through your bloodstream depends on a combination of genetics and lifestyle. Consuming fatty foods increases “bad” cholesterol, which blocks arteries and is the cause of most heart attacks and strokes. The American Heart Association recommends that people 20 years and older have their cholesterol checked every five years. While this is a helpful guide, the only way to know if you may be at risk is to consult your doctor for a screening. How can I prevent heart disease? While you can’t escape factors like genetic history, most risk factors associated with heart disease are choices we make about our health. The sooner you start making changes, the better. Now is the time to ditch bad habits like smoking and alcohol use. Do an overhaul of your diet to include more whole grains and cut out excess salt and fatty foods. Be sure to exercise regularly. And if you haven’t been for a check-up recently, make an appointment to visit your doctor for a blood pressure and cholesterol test. To see how heart disease affects your community, take a look at this interactive map from the CDC. © 2019 Calvary Women's Services. All Rights Reserved.